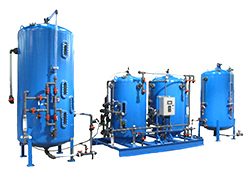 All Water Systems offers a variety of mixed bed deionizers to effectively remove the ions from water that can contaminate your water system or manufacturing processes. A mixed bed system uses 2 regenerative ion exchange resins which are formed in the shape of beads. These cation and anion resin beads are mixed together to remove more impurities with hydrogen and hydroxyl ions resulting in the production of high purity water. Mixed bed deionizer systems allow water to make repeated contact with the cation and anion beads. Because of the surface area, the water comes in contact with both types of beads creating more ion exchanges and resulting in more completely purified water. We offer a range of mixed bed deionizers for a wide range of applications and will meet with you to discuss and determine the best solution to meet your requirements. Our mixed bed water deionizer systems feature durable construction and provide optimal performance and repeatability in both service and regeneration modes. For More Information on mixed bed deionizer systems, call (412) 824-6560, or click here to contact us.